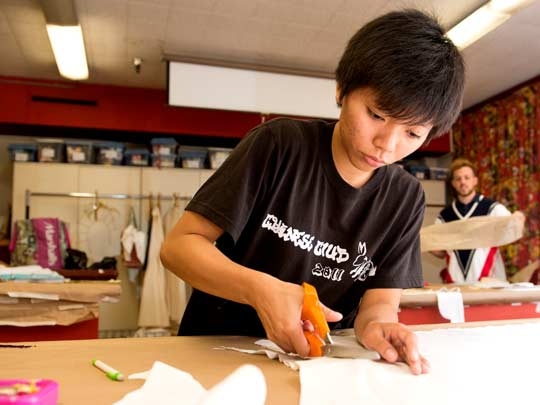 The Costume Stitcher Certificate provides the student with training in specialized sewing techniques and other skills necessary to build a variety of costumes required by the entertainment industry. Students also receive training in basic theatrical production practices. This certificate is designed to provide students with a course of study leading to certification and employment in the entertainment industry as a Costume Stitcher. This program requires the completion of 20-25 units, of which 14-19 units are in required courses and the remaining 6 units must be chosen from the restricted electives below. All courses must be completed with a grade of "C" or better. Outcome 1: Analyze if and how a garment can be altered to meet the needs of an actor. Outcome 2: Create historical corsets and underpinnings. Outcome 3: Demonstrate the application of theatrical closures including hook and eye tape, zippers and machine button holes. Outcome 4: Construct a complete garment from a historical time period using a commercial pattern. Outcome 5: Construct a period costume using a custom pattern with no written instructions.